It's no secret Hollywood suffers from colorism. While the "Black Girl Magic" movement is a step in the right direction (and slaying everythng in sight), on-screen representation still lacks showing the range of young, black actresses. It always seems like the same girl - looks wise - is used for every "black girl role." Disney starlet Skai Jackson knows about it all too well. She's a gorgeous, young, black actress making waves in the entertainment business, however, she herself has noticed that sometimes light-skinned actresses are nabbing roles, specifically written for a darker skinned actress. 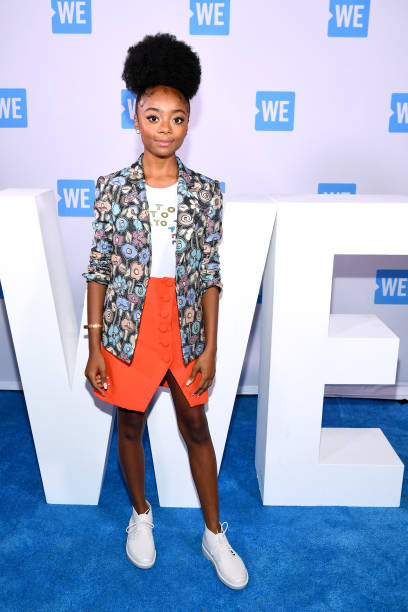 YBF Correspondent Tiffany Frances caught up with Skai backstage at the Barclays Center for the WE Day UN 2018 event recently where she dished on dealing with colorism in Hollywood. "There have been so many movie opportunities, movies that I'm seeing coming out that were originally books and they are originally made for dark-skinned girls, but a lighter skinned girl ends up getting the role," Skai told TheYBF.com. "I just think that's so unfair because it's like, there's so many of us that we could use and not just stick with the same old, same old. I just feel like they're being really safe with their choices." Skai said there's no hate towards lighter actresses who nab these roles because, of course, they're going to take the role they indeed earned. She simply wants filmmakers & creators to look deeper and notice that there are other actresses who don't have light skin and curly hair who could still slay the role. PREACH. The 16-year-old entertainer also talked about how she plans on transitioning from a "child star" to an adult entertainer, despite how people may react to her growing up. Peep our exclusive chat with Skai above.